In Afghanistan, Nowroz festival is traditionally celebrated for 2 weeks. Preparations for Nowroz start several days beforehand, at least after Chaharshanbe Suri, the last Wednesday before the New Year. Among various traditions and customs, the most important ones are: Haft Mēwa: In Afghanistan, they prepare Haft Mēwa (Seven Fruits) instead of Haft Sin which is common in Iran. Haft Mewa is like a Fruit salad made from 7 different Dried fruits, served in their own syrup. The 7 dried fruits are: Raisin, Senjed (the dried fruit of the oleaster tree), Pistachio, Hazelnut, Prune (dry fruit of Apricot), Walnut and whether Almond or another species of Plum fruit. Samanak: It is a special type of sweet dish made from Wheat germ. Women take a special party for it during the night, and cook it from late in the evening till the daylight, singing a special song: Samanak dar Josh o mā Kafcha zanem - Degarān dar Khwāb o mā Dafcha zanem Mēla-e Gul-e Surkh (Persian: ميله‌ى گل سرخ): The Guli Surkh festival which literally means Red Flower Festival (referring to the red Tulip flowers) is an old festival celebrated only in Mazari Sharif during the first 40 days of the year when the Tulip flowers grow. People travel from different parts of the country to Mazar in order to attend the festival. It is celebrated along with the Jahenda Bālā ceremony which is a specific religious ceremony performed in the holy blue mosque of Mazar that is believed (mostly by Sunnite Afghans) to be the site of the tomb of Ali ibn Abi Talib, the fourth caliph of Islam. The ceremony is performed by raising a special banner (whose color configuration resembles Derafsh Kaviani) in the blue mosque in the first day of year (i.e. Nowroz). The Guli Surkh party continues with other special activities among people in the Tulip fields and around the blue mosque for 40 days. Buzkashi: Along with other customs and celebrations, normally a Buzkashi tournament is held. The Buzkashi matches take place in northern cities of Afghanistan and in Kabul. Special cuisines: People cook special types of dishes for Nowroz, especially on the eve of Nowroz. Normally they cook Sabzi Chalaw, a dish made from rice and spinach, separately. Moreover, the bakeries prepare a special type of cookie, called Kulcha-e Nowrozī, which is only baked for Nowroz. Another dish which is prepared mostly for the Nowroz days is Māhī wa Jelabī (Fried Fish and Jelabi) and it is the most often meal in picnics. In Afghanistan, it is a common custom among the affianced families that the fiancé's family give presents to or prepare special dishes for the fiancée's family on special occasions such as in the two Eids, Barā'at and in Nowroz. Hence, the special dish for Nowroz is Māhī wa Jelabī. Sightseeing to Cercis fields: The citizens of Kabul go to Istalif, Charikar or other green places around where the Cercis flowers grow. They go for picnic with their families during the first 2 weeks of New Year. Jashni Dehqān: Jashni Dehqan means The Festival of Farmers. It is celebrated in the first day of year, in which the farmers walk in the cities as a sign of encouragement for the agricultural productions. In recent years, this activity is being performed only in Kabul and other major cities, in which the mayor and other high governmental personalities participate for watching and observing. The Saur Revolution (Persian: انقلاب ثور) is the name given to the Communist People's Democratic Party of Afghanistan takeover of political power in Afghanistan on 27 April 1978. 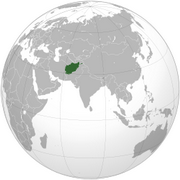 It is said that this movement led indirectly to the Soviet military intervention in Afghanistan. Commemorates the 1919 Treaty of Rawalpindi in 1919 which granted independence from Britain. The day was celebrated until 1992, when mujahedeen overthrew the former communist regime. The Taliban restored the celebration in 1996.